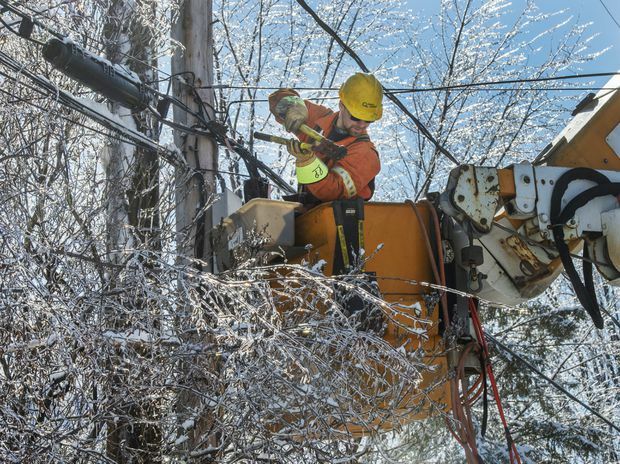 Hydro Quebec workers repair power lines in Laval, Que., on April 10, 2019, after an ice storm hit the area. Canada’s electricity sector will need to hire 20,000 new workers by 2022 as companies that keep the lights on across the country face a looming human resources crisis. The industry is undergoing rapid transformation driven by technological innovation and environmental challenges, but has an aging work force and expects to hire the equivalent of 20 per cent of its existing labour pool over the next three years, industry council Electricity Human Resources Canada said in a report released on Thursday. The power sector is forging ahead with some of Canada’s largest capital projects, including the refurbishments of four nuclear reactors of Ontario Power Generation’s Darlington plant and six units at Bruce Power’s generating station on Lake Huron. In 2017 alone, the sector invested $24.8-billion. At the same time, traditional approaches to generation, transmission and distribution are being disrupted by renewable energy developers, smart-grid technologies, off-grid power networks and the increasing need for high-end security to combat cyberattacks. OPG executives have said they face a significant challenge in ensuring they have the skilled workers needed to complete the Darlington project on time and on budget. However, the company has a plan to meet it, said Nirav Patel, director of human resources at the provincially owned energy utility. Mr. Patel said the council’s report points to the need for industry, governments, unions and postsecondary institutions to work together to ensure the sector’s demand for skilled workers is met. Smaller firms are eligible for wage subsidies to encourage them to hire apprentices, while colleges need to standardize the certifications in the trades. The sector currently employs 106,575 utility workers, and must hire the equivalent of a fifth of that labour pool by 2022. Of the 20,000 positions that will needed to be filled, 85 per cent will replace retiring employees while the rest will support industry expansion. Currently, less than 5 per cent of the sector’s employees are under the age of 25, a figure that is well below the national average, while women and Indigenous Canadians are also underrepresented, the report said. Women, for example, make up 48 per cent of the national work force but only 26 per cent of the electricity industry. “We’re concerned about the stagnant enrolment of apprenticeship and trade programs at a time when the sector is really hungry for skilled trades,” Mr. Pavel said. He added the utility sector can find it difficult to attract science, technology, engineering and mathematics, or STEM, workers given competition from high-profile tech-based firms such as Facebook and Shopify. Ms. Branigan said the sector has a compelling story to attract young Canadian workers, given its increasing focus on renewable energy, reducing greenhouse gas emissions, enabling electric vehicles, and introducing smart grids and other disruptive technologies.